Tempe is one of Arizona's most populous cities. It is adjacent to and just southeast of Phoenix, and is considered part of the metropolitan Phoenix area. It has a very diverse economic base, with a high concentration of technology-related companies. Tempe is the home of Arizona State University (Go Sun Devils!) which is one of the largest enrollment public universities in the country. Major employers include Motorola, Chase Bank Card Services, and Salt River Project. Tempe is a perfect example of a blend of corporate activity, residential neighborhoods, manufacturing, and recreation. And speaking of recreation, whether you live in Tempe, go to school in Tempe, or you are just visiting, there's lots to do there. Here are my top picks for Tempe attractions. Stroll the grounds of Arizona State University. This is where nearly 80,000 students from all states and more than 120 countries enroll each year. The Tempe Campus is the largest. Here's an online tour. Visit the Tempe History Museum and learn about the development of Tempe through history, or stop by the ASU Art Museum. Both are free. Go to a Spring Training baseball game at Tempe Diablo Stadium. Visit the SeaLife Arizona aquarium. It is located at Arizona Mills mall; it is indoors and air-conditioned. Right next door to SeaLife Arizona at Arizona Mills, spend your day in the world of Lego building blocks at the Legoland Discovery Center. Spend a leisurely Sunday in Downtown Tempe admiring original art and crafts, listening to music and enjoying the family-friendly atmosphere of the 6th Street Market. Beat the summer heat at Big Surf. It's a waterpark with swimming, water slides, and fun for people of all ages; it is open during the summer months. All year long, and cool in the summer, kids and adults alike can bowl, play laser tag, billiards and video games at Main Event. Explore Kiwanis Park. It's a wonderful park with a recreation center that includes volleyball, tennis, racquetball, baseball and softball batting cages and an indoor wave pool with a water slide! Take a short and not too difficult hike up Tempe Butte, otherwise known as "A" Mountain. It's behind the Tempe Mission Palms Hotel. Go shopping at Arizona Mills Mall. Aside from the Sea Life Aquarium and Legoland mentioned above, there are 175 stores, Harkins Luxury 24 Cinemas, IMAX Theatre, GameWorks for the kids and many restaurants. It's loud and busy! Enjoy a show at ASU Gammage at Arizona State University. If you are over 18 years of age, and looking for laughs, the Tempe Improv near downtown Tempe can certainly provide that for you. See dance, music, children's theatre, stage productions and art at the Tempe Center for the Arts. Stroll around Mill Avenue and downtown Tempe. Enjoy the shopping, food, entertainment , and libations. The Tempe Festival of the Arts is a nationally acclaimed event that happens each spring and fall in downtown Tempe. Arts, crafts, entertainment, food--the works! 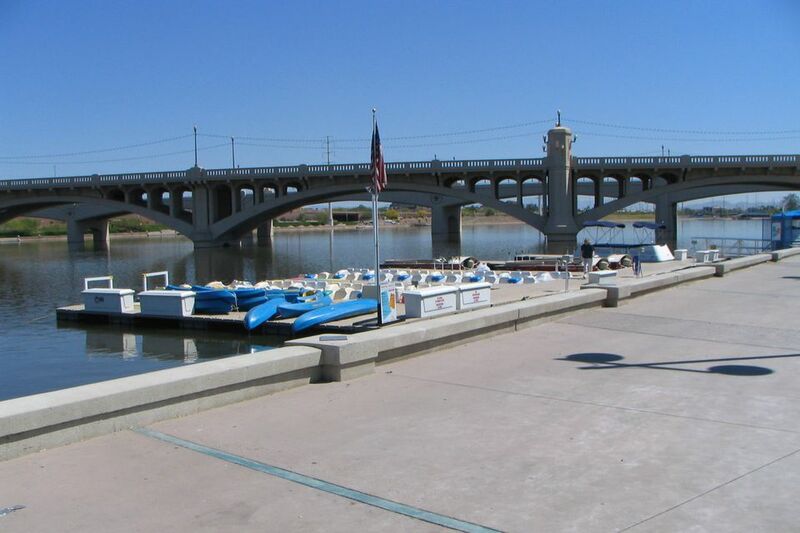 Rent a boat, fish, play, or attend a concert or special event at Tempe Town Lake and Tempe Beach Park in downtown Tempe. You can rent a kayak or a boat or take a Segway tour! Play golf at Ken McDonald Golf Course, a par 72 municipal course, or Rolling Hills Golf Course, with two executive nines. These courses are bargains, and even cheaper if you are a Tempe resident. The junior golf passes are fantastic if you've got kids that are working on their golf skills. Tempe Public Library has ongoing book discussion groups, speakers, and workshops on topics including business, politics, genealogy and more. There are computer and Internet classes. And don't forget the programs for kids! Enjoy your visit to Tempe, Arizona!